The Gold Miners have started the year with a cracking rally pretty much as they started last year. They have finally broken out of their downward trend which has been in place for around 4 years. As we write the HUI currently stands at 169.44 which is well off its recent lows, but is some 73% below its previous high of 630. The HUI now looks to be rolling over, although it is too early to say that this rally is over for now, it is beginning to look that way. 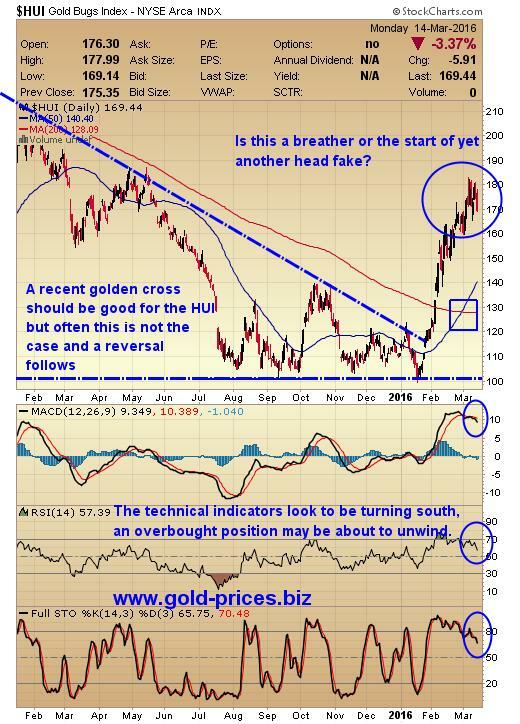 A recent golden cross, whereby the 50dma crosses over the 200dma in an upward motion should be good for the HUI, but often this is not the case and a reversal follows. The technical indicators that we have shown here, the RSI, MACD and the STO look to be turning south suggesting that this overbought position is about to unwind. A correction at this point would be healthy for the miners as a straight up trajectory usually doesn’t end well. This week we have the meeting of the FOMC followed by a press conference chaired by Janet Yellen. We doubt that there will be a rate hike this month, but the Fed speak surrounding their future intentions regarding further rate hikes will be the focus for gold bugs. We also have Super Tuesday and the looming prospect of a Donald Trump nomination for the Republican Party. Again it is a little early to try and predict what effect that this would have on the economy, the US Dollar and the precious metals market. For now though we can see that gold and the miners have burst into life and that silver prices have yet to confirm this break out as they need to do the same thing by forming a higher high, that is a close above the $16.00/oz level. As we know nothing goes up or down in a straight line and this is certainly true for the gold miners. The next test for them will be the summer doldrums, which could coincide with a rate hike putting upward pressure on the US Dollar and inversely downward pressure on the price of gold. Should this indeed happen then a buying opportunity at possibly cheaper entry levels than we have seen so far could be presented to us. Disclaimer: www.gold-prices.biz makes no guarantee or warranty on the accuracy or completeness of the data provided. Nothing contained herein is intended or shall be deemed to be investment advice, implied or otherwise. This letter represents our views and replicates trades that we are making but nothing more than that. Always consult your registered adviser to assist you with your investments. We accept no liability for any loss arising from the use of the data contained on this letter. Options contain a high level of risk that may result in the loss of part or all invested capital and therefore are suitable for experienced and professional investors and traders only. Past performance is neither a guide nor guarantee of future success.